During the last decade, the State of Veracruz (Mexico) experienced a series of intense rainfall seasons with more than 1000 registered landslides. As a consequence, more than 45,000 people had to be evacuated and resettled. Even though the mountainous areas of Veracruz are highly prone to landslides, neither susceptibility maps nor any other relevant information (distribution of landslides, geology, etc.) with high spatial resolution is available. The high social impact of the most recent landslide hazards points out the necessity of detailed investigations in the affected areas. The aim of this study is to improve the understanding of process dynamics for the landslides and to provide the base for future susceptibility mapping. As an example, a young landslide with a high complexity of nested processes from the year 2013 is selected for detailed investigations in the east Trans Mexican Volcanic Belt in the State of Veracruz, related to the complexity of the studied landslide a multi-methodological approach is applied, which includes geomorphological mapping, sediment characterization as well as geophysical methods (electrical resistivity tomography, seismic refraction tomography). Field results indicate that the studied landslide must be regarded as a reactivated older landslide body, with a variety of intricate processes and numerous secondary slides. 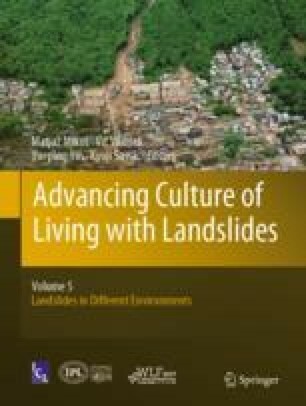 Detailed investigations provide deep insights in the dynamics and interactions of landslide processes related to their natural and anthropogenic settings. The authors would like to thank the German Research Foundation (DFG) (Te295/19-1) and the German Academic Exchange Service (DAAD) for funding. Furthermore, we thank the Civil Protection of Veracruz, for their cooperation. We also would like to express our appreciation to the landowners and the community of El Capulín for their help. Special thanks goes to Dr. Elizabeth Solleiro Rebolledo (UNAM) for scientific and personal support.